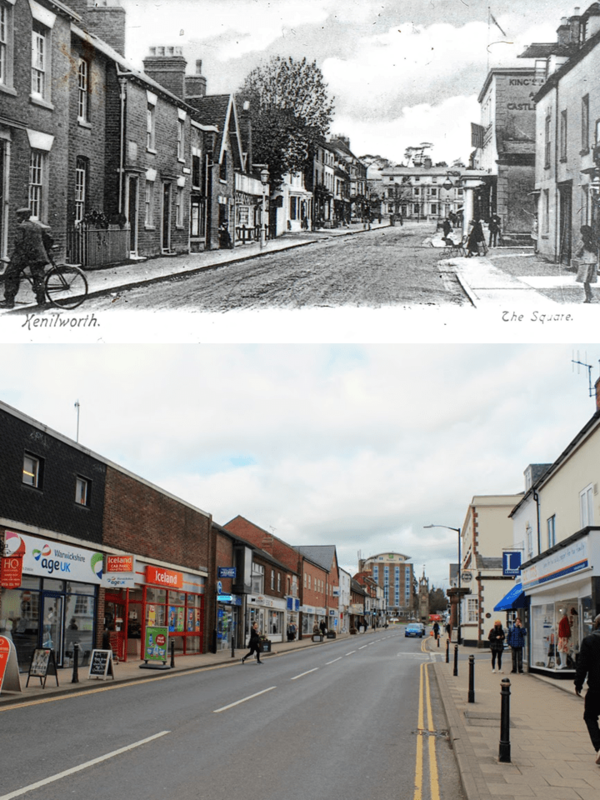 This scene of Warwick Road and The Square is much like many other postcards of the scene from the era. It does however show The Square before the Clock Tower was built in 1906. The right hand side of the scene is not unfamiliar to modern eyes. The buildings either side of Station Road, including the Kings Arms & Castle, are immediately recognisable. The left hand side is almost completely different save for a few surviving buildings at the Clock Tower end. The buildings behind the Clock Tower itself at Abbey End were of course destroyed by the Luftwaffe during the blitz of November 1941. The Holiday Inn now looms over the scene. The ‘then’ scene can be dated as between the 1880s, when the safety bicycle being wheeled onto the pavement was first popularised, and 1906 when the clock tower construction began. Post-war Then & Now scenes from the 1950s and the 1960s show the sorry state of The Square in the years after the blitz. The loss of the buildings on the left of our ‘then’ image, such as the timber framed building on the site now occupied by HSBC bank, were entirely self inflicted. The gable-ended number 50, The Square (visible just left of centre) was demolished as recently as 1982. Steven Wallsgrove recorded in Kenilworth History 1983 that “There was no evidence that this building was timber-framed and it was not listed (although its slight projection forward of the building line had made one member suspicious). It was only when the building was being demolished on Sunday 28th March 1982 (following planning permission for the redevelopment of the site) that any timber framing was exposed. This was noticed by a local architectural historian, Dr. Richard Morris, who reported the matter to the Society promptly and took photographs of the framing on both the south and north sides. A number of other photographs were then taken of the framing on the north side, together with a few measurements. It was observed that a number of timbers were being, and presumably had been burnt in the bonfire at the rear of the site”. He concluded that the style of framing appeared to indicate a building of possibly early 17th century date. This building was subsequently demolished and the plot is now occupied by the rather dour looking Halifax Bank building.